Roughly half of the emails or DMs we receive on Instagram are from people just like you. They’re wondering: Should you invest or pay off debt? If we are being honest, we think about this pretty often ourselves. Francisco, one of The Finance Twins, has over $200,000 in student loans alone, so it’s a question that is still very relevant for us. 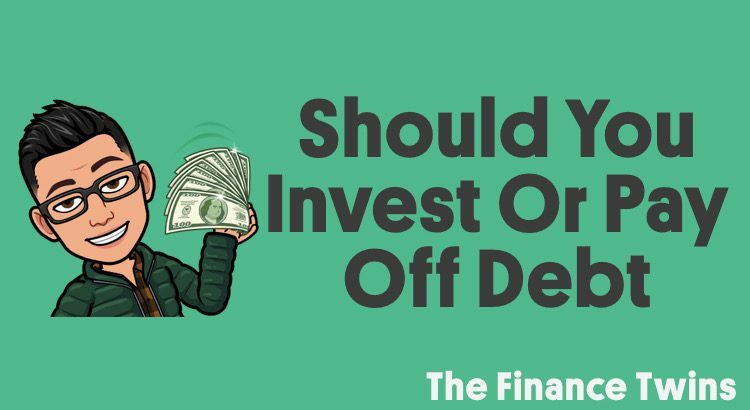 In truth, the answer to whether you should pay off your debt or invest is that it depends, so let’s explore this further and get to the bottom of it. It’s important to realize that the decision of whether to invest or pay off debt is a great choice to be making. It means that you have extra money and instead of trying to look rich, you’d rather make a smart money decision. This is awesome. It’s interesting though, because a lot of the time, the person facing this dilemma and reaching out to us feels stress and anxiety. So we want to make sure to remind you that if you pay off a debt when you should’ve invested or invest when it would’ve been optimal to pay off debt, that’s okay. The majority of the time, this is not a money mistake that you should be losing sleep over. So if this is a win-win, does it mean it’s not possible to make a mistake? No, there are definitely specific situations or circumstances when it absolutely doesn’t make sense to invest or pay off debt. For example, you also don’t want to be investing in the stock market with your extra cash if you have a credit card balance with an interest rate of 25%. Historically, the stock market has averaged a 5%-7% return after inflation, so compared to a 25% interest rate on a credit card, you should pay off the credit card ASAP. Investment returns are never guaranteed, so there’s a chance the stock market could drop 20% (or more) in a year. Meanwhile, every time you pay off debt, your money is effectively getting a guaranteed return of the interest rate on the debt, because for every dollar you pay off early, you are saving yourself the interest that would would have paid on that dollar if you hadn’t paid it off. That’s why paying off a 25% interest credit card with extra money is like getting a GUARANTEED 25% return on your money, so comparing that to getting an expected return of 7% in the stock market, is a no brainer! You should clearly pay off the credit card to get that guaranteed return! It’s important to remember that most ‘invest vs pay off debt’ decisions are not black or white, and so they require extra thought. Here are five questions you can ask yourself to help you make the decision about what makes the most sense for you. 1. How Much Sleep Do You Lose Over Debt? For many people, being debt free (no mortgage, no car loan, no student loans or credit card debt, etc.) is one of their top financial goals. For these people, who hate debt, there is no greater feeling than not owing anyone a single penny. If you identify with this perspective, then there’s a good chance that no amount of investment returns could sway you to invest instead of paying off debt. If the guaranteed returns of paying off debt makes you feel warm and fuzzy, then it’s a good sign that it’s the right decision for you. 2. How Much Financial Risk Do You Want To Stomach? If you’re focused on growing your wealth more aggressively and want to make as much money as possible, regardless of whether that means having debt, then things become more cloudy. If you like to invest in index funds as long term investments and have a 3.25% mortgage, there’s a decent chance (not a guarantee) that you’ll make more money investing, on average, than if you were to accelerate the payments on the mortgage. You just have to remember that personal finance is “personal” and what is right for one person, isn’t necessarily right for you. If you are married, you need to discuss these decisions with your spouse so that everyone feels comfortable with the decisions and the risks involved. But again, remember that most of the time, this is a huge win-win! Either way you are investing for the future, which is exactly what you should be doing. 3. Have You Taken Advantage Of Matching Contributions Or Tax-Advantaged Accounts? If you already have a monthly budget, then the first thing you need to look into is whether you are eligible for a 401K or other retirement account matching contribution from your employer. If you don’t have a budget yet, here’s a step-by-step guide. This will help you save even more money to invest or use to pay off debt. The reason that making sure you are taking advantage of matching contributions is that they should be seen as a guaranteed investment return of 50%, 100% or whatever % they match. For example, if your employer matches 100% of your contributions for the first 6% of your income, that means that if you contribute 6% to your 401K, they will match it and you’ll end up with 12%. This is a guaranteed 100% return on that money! If this is available to you, then this needs to be your #1 priority. Yes, even before paying off that 25% credit card. Other accounts with tax advantages are Traditional and Roth IRAs, which are also retirement accounts. 4. How Expensive Is Your Debt? Let’s face it. Not all debt is created equal. Some loans may have variable interest rates, others are fixed. Some have low interest rates, and other have outrageous interest rates. The type and amount of debt that you have needs to be taken into account. If you have a 2.75% (very low interest) mortgage from a few years ago, and you haven’t started saving for retirement, then we think it makes sense to invest. Have a student loan that you can’t refinance and has a 9% interest rate, then paying that off sooner might make more sense. If you aren’t sure what the interest rates on your debt are, make sure you start a google spreadsheet or another document with all of your debts listed and the relevant interest rates on them. It’ll help you see where you stand and get a better sense for how much you owe. If you aren’t sure how many loans you have, you need to run your free credit report at www.annualcreditreport.com. This site is the only legit government approved site where you can get your credit report for free once per year for each of the 3 credit reporting bureaus. We like to space our reports out for each agency so that we can see a report every 4 months. 5. Will Paying Down The Debt Help You Advance Other Goals? If you have dreams of buying a rental property, it could be harder for you to borrow money if your debt to income ratio is out of whack. So therefore it could make sense for you to pay off your debt faster to improve that ratio. Alternatively, if your credit score is being adversely affected by a high credit card utilization rate, and you need to get a loan to buy a used car, then having a better credit score can help you get a lower interest rate, and thus save you money. 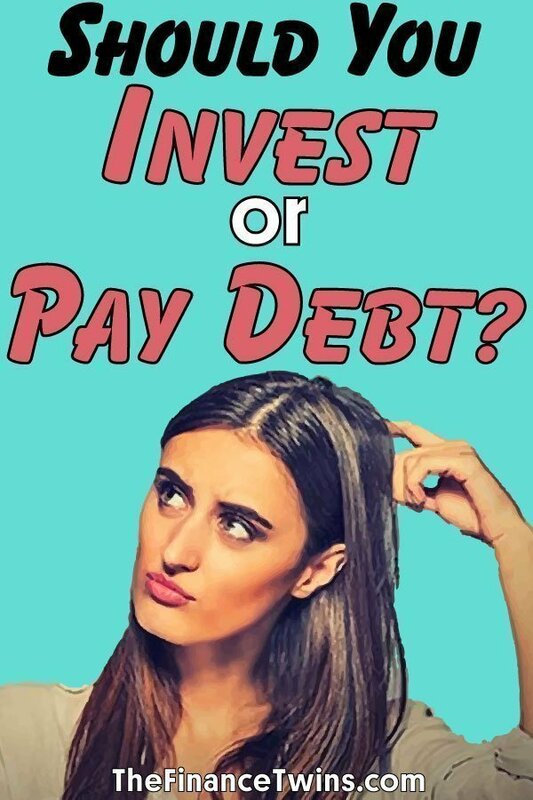 What If I Am Still Unsure About Whether To Pay Off Debt Or Invest? If you’re still unsure, confused, afraid, or simply keep avoiding making a decision, here’s a list of steps you can follow in order to decide. If you’ve read our Beginner’s Guide to Personal Finance, then you recognize these steps already! 1. Max The Employer Match! Not maxing out this matching contribution doesn’t make sense. It is exactly the same as walking past a $10 bill on the ground and not stopping to pick it up. Don’t be a dummy. Pick up the money. Now that’s a rhyme we can get behind. Ok, we’ll stop now. This debt will continue to grow until it is paid off. You should put every extra dollar you have on hand into paying down high interest debt. It is important to realize that your student loans will probably fall into the high interest category if they are not subsidized. They might fall here regardless, so you need to see what your rates are. Don’t include mortgages here since they are often large and can prevent you from saving for retirement for several years. Check with your loan providers or credit card companies to figure out your interest rates if you don’t know them. 3. Open A Roth IRA. Now it’s time to start to save in a Roth IRA! You can think of it as a bank account, except that you decide what you want the money invested in. Why not just save more money into a savings account or open a normal brokerage investment account? The answer is that IRA accounts can save you a lot money on taxes when you retire. You’ve already paid down your high interest debt so you should be very familiar with the drill. This moderate interest debt can include personal loans, subsidized student loans, and other moderate interest loans. If you are averse to having any debt at all, this is the place where you’d prioritize paying off all of your debt (even low interest debt). Now that you’ve tackled the other steps, you can make an even bigger monthly contribution to your retirement savings. We recommend a savings goal of 20% of your gross income for your retirement. Or more if you started late or are behind on retirement savings! As you decide what to do with your hard-earned money, this will give you a solid foundation as to whether investing or paying off debt makes more sense. I have always sided with the paying off debt if forced with a choice (it’s better if you can compromise and do both). I paid off my mortgage and it was the best decision ever. Becoming completely debt free is something you have to truly experience. A huge weight off your shoulder is lifted and it really is freeing. I know I left money on the table by not investing the money I used to pay off the mortgage but that is looking back in retrospect with one of the longest bull runs ever in the market. The money could have easily gone down if I had a lump sum and put it in the market right before a recession. A 50% loss early on requires a subsequent 100% gain to break even. Paying off debt is a guaranteed return. My favorite post in my blog is “Every Blade of Grass” which tells of the moment I owned every blade of grass on my property and not the bank. Another telling sign is if you ask anyone who has a completely paid off home would they take a mortgage to get back money to put in the market, the vast majority would not. I’ve heard from several people how paying off their mortgage felt like a HUGE weight was lifted off their shoulders. Must be an incredible feeling. Thanks for sharing! I’ve switched 4/5 for myself, but only because I’d like to take advantage of pre-tax contributions each year!